Sold by EACHSHOT and Fulfilled by Amazon. Gift-wrap available. 【Advanced Features】360 barrel roll,POV mode,PhoneGo Mode, Panorama, focus timelapse, motion timelapse, long exposure timelapse and etc. Package: The Weebill comes with a very convenient case so I don't need to spend money on a bag/case. I already have a backpack for my drone, which can also fit the Weebill. There are a few extra slots to put in a few accessories inside and necessary cables are provided. 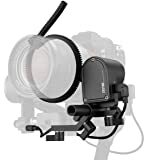 I'm glad they decided to shave off the follow focus in the main package as that adds to the price. I really hope the individual accessories go on sale soon. 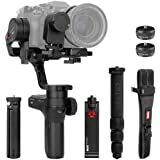 Build Quality: The gimbal is very well built and sturdy. I cannot test the longevity of the moving parts until I've used this for at least a year. My 2 main Olympus Zuiko MFT lenses have the same weight so I don't need to keep re-balancing and adjusting. The grips feel really good and the sling mode feels natural to hold. I was very skeptic before about sling mode but it actually works. Footprint: The Weebill is almost half the weight of Ronin-S with a portable size meant for travel. This is the perfect run and gun gimbal for my use case, which involves event coverage and annual travels. People will look at you holding your cute gimbal but it's not a tank like the other stabilizers. Despite its small size, Zhiyun managed to put a screen with the info you really need and you can even change motor settings which is a plus. There are multiple buttons, which I love but am afraid to click accidentally so I find myself always rechecking my Control Mode using the screen. As for the wheel, it feels alright but not as good as my drone's joysticks. I struggle a bit with precision on diagonal joystick movements. Balancing: Whoever thought of the axis locks is a genius! 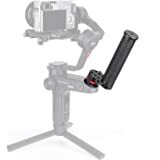 It makes balancing the gimbal less clunky. Youtuber Chungda explained balancing pretty well on his video so I recommend giving it a watch. There are some reviews online of people with longer and heavier lenses, where balance may become an issue and in turn stabilization suffers. My lenses are 410g and I've had no problems at all. I'm still waiting for my Blackmagic Pocket 4K, which a Korean Youtuber managed to balance using some counterweights. Right now, I've been using my wife's Olympus EPL camera and it's been a breeze. Stabilization: I made a video of available Control Modes for the Weebill. I suggest learning these inside and out since certain cinematic moves can only be done on a certain control mode. You don't want to be fiddling with your gimbal and end up missing a good shot. For modes like POV, manipulating the gimbal where it hits over 45 degrees cause vibrations. If you're familiar with the limitations of each control mode, you shouldn't have any problems. Some light gimbals will have bobbing problems but since my camera and lens aren't on the lighter end it's not bad at all. ZY Play App: I've never been a fan of using a phone as a monitor, even though that's what I always do when filming with my drone. I don't think I'll ever use image transmission and I doubt the ZY app would have Blackmagic camera support anyways. With the app, the timelapse would be my most desireable feature. I also like how you can change gimbal settings and update firmware through your phone. Some early buyers already have complaints of lag and delay in image transmission so hopefully a software fix is in the works. 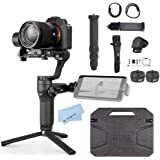 Price - The Weebill is the same price as the Moza Air 2 and cheaper by $100 than the Ronin-S. For the features and footprint, I'd say this is a very good deal. I honestly had the Ronin on my cart since I have quite a few credits from the store. Then, the Air 2 got announced with some tempting bonuses and I put that in my cart instead. 3 days after, Zhiyun announced the Weebill and after doing some Excel comparison spreadsheets, I've come to the conclusion that the Weebill has the most value of the three. It became even more apparent when I got my hands on it. If you have read up to this point, thank you for your time! 2.0 out of 5 starsWish it would work for my setup. I just got through balancing it with my EOS R and just about every lens I could find, including some very lightweight ones. Definitely under the weight limit. It would work for a little while but after I start using it, the motors would give up and go limp. The connection to the phone was still there, but no motors. Only way I got it to 'wake' back up was to turn it on and off. And then it would motors would go out, again. I could not use it. I love everything about it-the features, the OLED screen, the comfort, so I was really bummed out that it wouldn't work for me. Mind you, it does work for a lot of people with different setups, but I'd ask around a bit. I have the Zhiyun smooth 4 and love that. I also have the DJI Mobile 2 and its autotracking is just amazing. 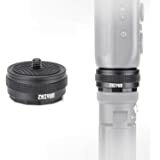 I have had great luck with DJI, including the Osmo Pocket (I have 2 of them and people always ask me what it is). I have the Ronin M which takes every combination I throw at it. I wanted to love and cherish this, but it doesn't work for me. Be VERY careful about what your configuration is. People with Sonys--some have to take the viewfinder rubber piece of for it to tilt properly up. Zyiyun--please give me a version 2 or firmware fix for this--I know I would really love it if I could use it. 5.0 out of 5 starsUpgrade! 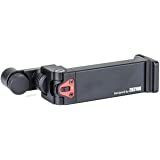 Bought this recently to pair with my Panasonic Gh5 and Gh5s - this gimbal is PERFECT pair for my setup! The size and functionality is what I've been looking for. 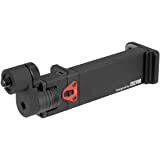 I owned the Zhiyun Crane 2 and it was just too robust for my Run-n-Gun needs. I often opted to bring my Glidecam over my gimbal due to the setup time and how easy it was to transfer around. I shoot a lot of weddings and needed something easy to transport and could fit into my already crowded and heavy bag. The Weebill Lab hits all the check marks. I especially like how ALL the axis' can be locked during transport and how light weight it is. The plastic doesn't bother me - I take care of my gear and haven't had issues in the past about gear falling apart after I use it. 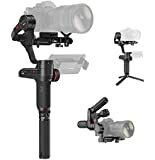 The multiple points of contact for holding this gimbal is nice - and I like the versatility this gimbal offers when paired with the quick release attachments for mini tripod to tripod. MY ONLY GRIPE - is that the wheel or focus wheel gets in the way of filming for me. As a left-hander the wheel sits in an awkward spot and I don't feel like I can get a solid grip onto it with one hand. Other than that - I like the plastic (keeps it light), I like the ergonomics (minus the wheel placement - or perhaps an option to remove it? ), and I like the added functionality, POV mode is cool, multiple points of contact, how small it is, battery life is plenty long, motor doesn't block screen (more important for Sony and Canon cameras), and I just love this company and all their innovations. 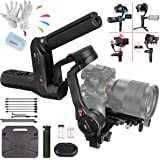 I would definitely recommend this gimbal for the lighter setups out there - this camera was able to support my Sony a6400 with Sigma MC-11 Converter + Sigma 18-35mm f1.8 lens. Motors held strong and had no micro-jitters - - wouldn't recommend this setup, but just shows how strong the motors are. I use it mostly with the Gh5s + 12-35mm f2.8 or Sony a64000 + 10-18 f4.